I finished hand-sewing the binding onto my blue quilt on Monday, but my laptop was out of commission so I couldn't post pictures about it until today. 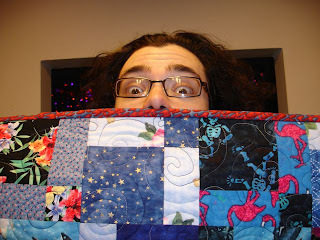 Here's the entire quilt so that you can admire the wide variety of totally random fabrics that went into it. And here's one including my helpful quilt holder. 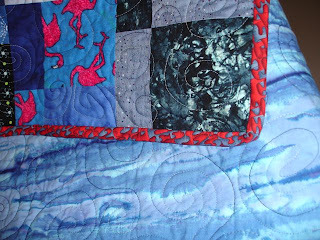 I quilted it in little spirals, which I thought looked sort of like wind or water and were therefore appropriate for a blue quilt. It's the biggest quilt that I've quilted so far - roughly 60" x 80". It wasn't that bad to manipulate through my machine during free motion quilting, but it sure did use up a lot of thread! I had to go buy more half-way through quilting it because I ran out. I waffled on the binding for quite a while. 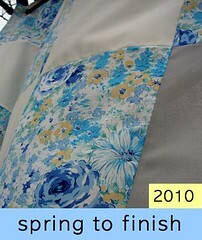 I considered about 8 different fabrics and finally narrowed it down to this one and a solid blue one. The solid blue one was just too boring. It's a pretty bold choice of binding for me and I'm not sure that I *love* it, but it was good to try a binding that stands out. 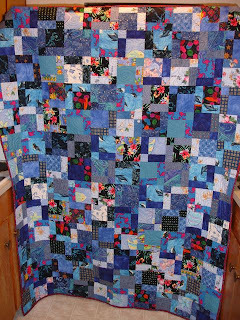 I like how the red-and-blue brings out the bright colors in the other fabrics, but I don't have a very good picture that shows the binding in relation to the whole quilt. Piecing thread: I was doing this as a leader / ender project, so it's pieced with whatever thread I was using for the "real" project I was working on. Piecing needle: variable for the same reason. Quilting thread: blue variegated Signature size 40 cotton thread; same thread as for the river quilt. This is why I ran out half-way through. Tension: increased to about 6. Paintbox Quilt-A-Long - Blocks finished! !